Frank Catania, right, and Nate Barone of the winning team Trevor, Nate & Co., present their product during the final judging round. The heat was high at Sacred Heart University’s West Campus recently, though the temperature outside had dropped below freezing and a snowstorm was fast approaching. Creating a spark in the cool “Jetsons”-like hallways and classrooms at the former General Electric headquarters, now home to SHU’s computer-oriented programs, was the College Tech Challenge and Hiring Fair, which the University hosted for the first time in the competition’s three-year history. The challenge occupied the morning from 9 to 11:30 a.m.; the hiring fair took place from 12:30-3:30 p.m., with a break to present awards to winning teams. In the challenge’s engineering category, the winning team was Trevor, Nate & Co, from SHU, with members Nate Barone, Frank Catania and Trevor Neal. (Neal was not feeling well the day of the competition.) The coding team co-winners were the Fat Dads from University of Connecticut (Christopher Vasallo, Jack Violet and Thomas Finn Navin), and the Bobconcatonators from Quinnipiac University (Joseph Germain, Daron McIntosh and Aaron Paterson). The competition this year involved 16 Connecticut-based colleges and began in September. A challenge took place at each campus (both public and private institutions), assessed by three to four judges who were a mix of local tech representatives and faculty. Winning students from each campus were tapped to go on to the finals at SHU. In all, 250 students, predominantly sophomores through seniors, initially competed, with 79 students going through to the final challenge and 20 judges on hand for assessment. Coding students at each campus first took a coding test. Top students were identified, formed teams and were charged with developing and presenting a “hack” that helps opioid addicts and those in recovery find supportive resources quickly and effectively. On the engineering side, students were challenged to provide a means to reduce driver-induced accidents. Carlson likened the competition to speed-dating, wherein the students were stationary and the judges moved around from team to team. In this way, he said, company reps could assess students’ tech skills and see if they were team players, thereby getting a rounded preview of potential talent they might want to hire. The first year’s challenge took place at RentschlerField in UConn’s football stadium in East Hartford. Last year, it was at ahotel in Bristol. Wanting a more academic environment, the CTC partnered withSHU at the invitation of Tolga Kaya, SHU’s director of engineering and associateprofessor of computer engineering in the University’s School of ComputerScience and Engineering. Kaya was equally pleased the CTC accepted the invitation. “The vision for the West Campus was to have it be an innovation hub. We want to foster creativity, idea generation and organic industry collaborations,” he said. Among the finalists were six SHU students, all in the engineering sector, split into two teams. Kaya was excited to have their representation, given that SHU’s computer engineering program is only in its second year, and the students were able to interact with local technology companies early in their academic experience. The six SHU team members included freshmen and sophomore engineering students as well as business students. 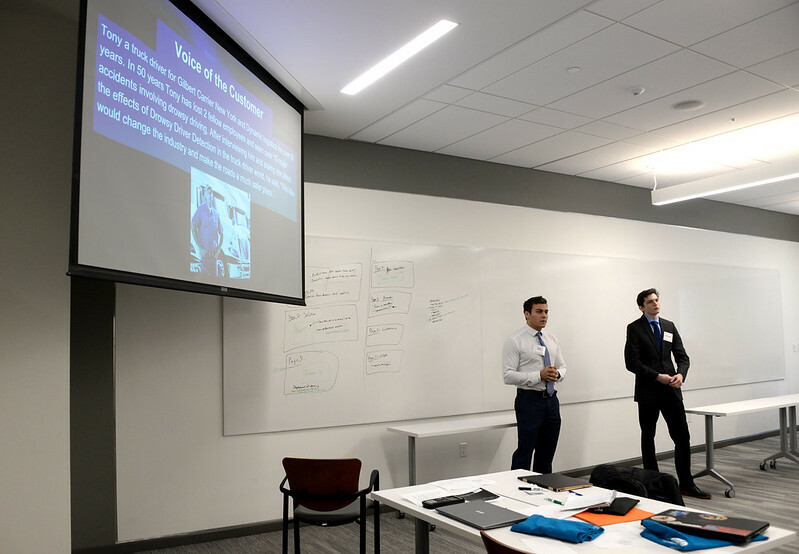 One SHU team that appeared to have skills was the self-dubbed Engi-Masters, comprising freshman Wesley Hammerschmidt, sophomore Lucinda Cahill and junior Jay McEachern. They claimed to feel like “kids in a candy store,” given this unique forum for interaction. The students aspire to become a public accountant, hardware engineer and mechanical engineer, respectively. Among the other college teams competing in the engineering category were the Bantam Engineers—Alison Adams, Shannon Phillips and Hanna Engstrom from Trinity College. They said they were excited to represent their school and felt confident about their prospects as more experienced seniors. In the coding sector, the Webtrotters—sophomores Paul Pasquerelli,Anthony Latorre and Khameron Chaddha from Manchester Community College—werejazzed to be making a custom website that would be judged on accessibility,presentation and functionality. If you are unable to view the photo gallery above, visit https://www.flickr.com/photos/sacredheartunivpix/sets/72157675698759598.